In researching our next book, Beloved Woman, Cyndi and I are discovering lots of interesting historical facts that aren’t well-known. 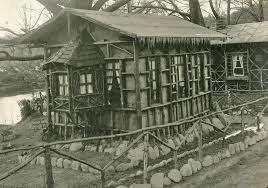 Did you know that during WWI, there was a German internment camp in Hot Springs, NC? Erected on the grounds of the Mountain Park Hotel (now Hot Springs Resort), it held 2200 prisoners. Supervised by the Department of Labor, these men weren’t considered prisoners of war but rather enemy aliens because they were the civilian officers and crew of German and Austrian commercial ships that took cover in American ports when Great Britain declared war on Germany in 1914 for fear of being attacked crossing back over the ocean. The officers stayed at the hotel and lived a comfortable lifestyle with heated rooms and electricity while the other aliens resided in barracks built on the grounds of the hotel. 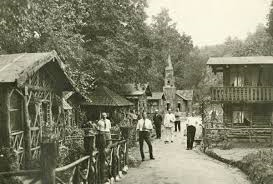 The officers played tennis and billiards and bowled in the hotel’s bowling alley while their men busied themselves building two small German villages and chapels out of driftwood from the French Broad River, debris from the Great Flood of 1916 and Prince Albert tobacco tin cans. They even built a carousel with chain-suspended chairs that played music as it turned. I’ve placed 2 pictures of these lovely, rustic buildings within this post. In the one to the right, you can see one of the chapels in the background. Although the citizens of Hot Springs were wary at first, they soon realized these men posed no danger and allowed officers escorted by guards to have dinner with them and speak before students of the Dorland Institute. A 35-member German brass band played concerts on Sunday afternoons, attended by people from Hot Springs and beyond. Some of the officers’ families moved to Hot Springs and visitation was allowed between the officers and their families in Hot Springs and at the hotel. The only real discord arose when the citizens realized that the aliens ate better than they did, having meat twice daily while they were bound to honor meatless and wheatless days. Once the DOL learned of this, they required the aliens to observe meatless and wheatless days as well. In 1920, the government transferred custody of the aliens from the Department of Labor to the Department of War, at which time the DOW decided to send them to a prison camp in Georgia where they would be required to perform labor beside real prisoners of war building roads. No one wanted to leave and a case of typhoid broke out among the aliens – many suspecting they deliberately drank contaminated water so that they could stay. In the picture above, you can see the detail that went into these small houses. Each had a matching gate and walkway and the aliens heated them with furnaces they built from cast off bricks and stones. One had a miniature widow’s walk and the spindles on one porch railing were made from empty thread spools. All in all, the people of Hot Springs were proud of this camp and treated the aliens well, so much so that they did not want to leave.